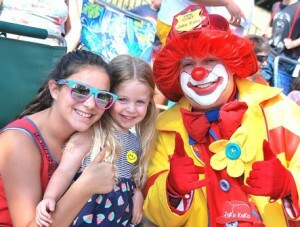 (l to r) Elizabeth Grasso, 12, and her cousin Lilly Chiasson, 4, meet Joko Koko of the Aleppo Shrine Clowns along the parade sidelines. 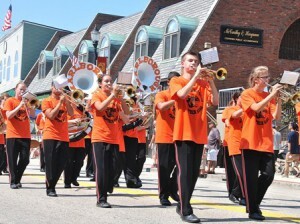 Marlborough – The unofficial end-of-summer weekend concluded sunny and hot Sept. 7 for the 64th annual Marlborough Labor Day Parade. 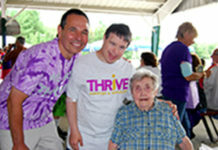 With this year’s theme of “Marlborough – a Community Filled with Pride,” the parade featured state and local elected officials, 25 bands, several decorated floats and marchers representing nonprofit organizations. The 1.7-mile parade route also served as the campaign trail for some city political candidates. 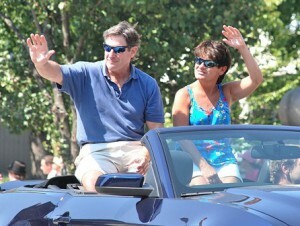 Honored as grand marshal was Darren McLaughlin, riding in style in a 2009 Ford Mustang with his wife, Laura. 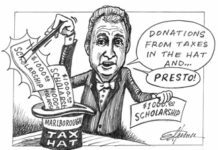 He serves multiple roles with the Marlborough Regional Chamber of Commerce (MRCC): vice chair of the Executive Committee, president of the Marlborough Regional Community Foundation, and chair of the Scholarship and School to Business committees. As general manager of Wayside Racquet & Swim Club, McLaughlin hosts annual fundraisers benefitting the MRCC Scholarship Fund, Marlborough Lions Club and Greater Marlborough Programs, Inc.
A number of parade spectators claimed prime viewing spots by arriving that morning for the Marlborough Lions Club’s 34th annual Labor Day Bed Race. 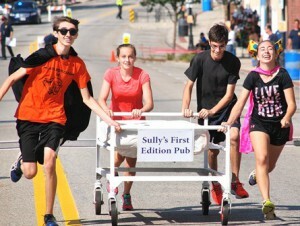 This year, 17 teams of four runners sponsored by businesses and nonprofit organizations pushed hospital beds east to City Hall, where they applied linen. After continuing further east and making a U-turn, they raced back to City Hall and removed the linen. The winning team sponsored by Wayside Racquet & Swim Club consisted of Marlborough High School Cross Country teammates Jeremy Barnes, Owen Crisafulli and Tom Redden, and Coach Jeff Downin. 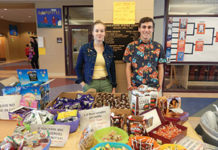 Proceeds help the Lions Club with its ongoing charitable causes including eyeglasses for those in need. 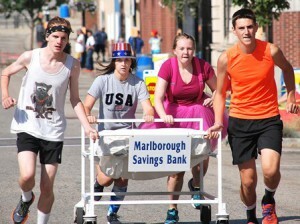 Finishing a close third-place in 1:56 is the team sponsored by Marlborough Savings Bank, consisting of Marlborough High School Cross Country runners (l to r) Logan Cochran, Emily Dickson, Elizabeth Smith and Spencer Geary. Division 14 cheerleaders display their spirit as they march with other Marlborough Youth Football and Cheer teams. 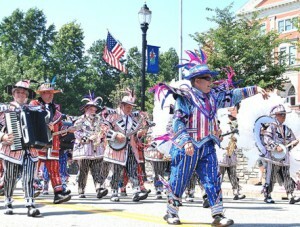 Best known for participating in Philadelphia’s annual Mummers Parade, the Aqua String Band visits Marlborough. 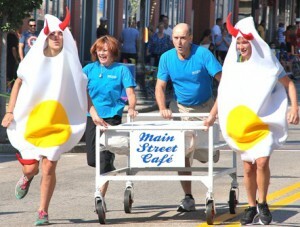 Main Street Café owners Mary and Randy Scott (center) take a break from the breakfast shift with (l to r) Maddy Plante and Rachel Curley costumed as deviled eggs. 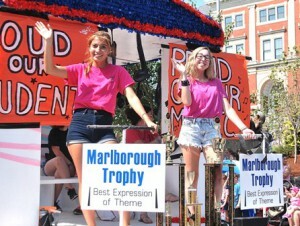 Marlborough High School Music Department students ride a float with signs proclaiming pride for them and music, which won the Marlborough Trophy for best expression of parade theme. 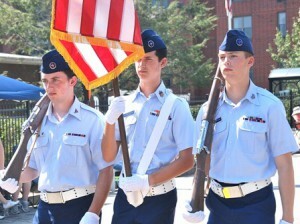 The Civil Air Patrol color guard leads the Lt. Col. Frank Pocher Minute Man Squadron. 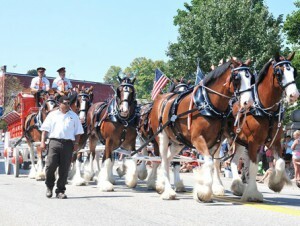 An eight-horse Clydesdale hitch travels on Main Street. 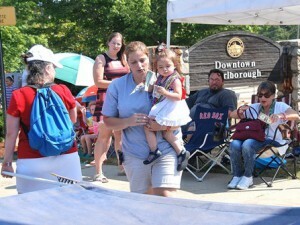 Karen Busa and her daughter Sophia, 1-1/2, make a donation in a blanket carried along the parade route by volunteers for Disabled American Veterans Chapter 82. Proceeds go toward hospitalized disabled veterans. Finishing a close second-place in 1:55 is the team sponsored by Sully’s First Edition Restaurant and Pub, consisting of Marlborough High School Cross Country runners (l to r) Logan Cochran, Amanda Vilensky, Youssef Naim and Maria Stefanova. Jackie Smith, the Marlborough Regional Chamber of Commerce program and event manager, and Susanne Morreale Leeber, president and CEO, promote Oktoberfest to be held downtown Saturday, Oct. 3, the second of a three-day Heritage Weekend. 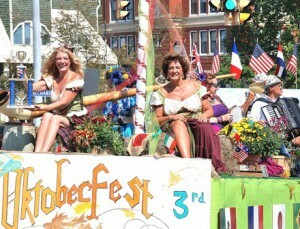 Deemed by the judges as the best overall float, it won the Grand Marshal trophy. 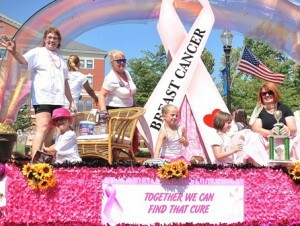 Four-time cancer survivor Vikki Crowley (far left) and Team Vikki raise awareness of the Just ‘Cause Breast Cancer Walk, which benefits the Gillette Center for Women’s Cancers at Massachusetts General Hospital in Boston and the Virginia Thurston Healing Garden in Harvard. The float won the Judge’s Choice trophy. 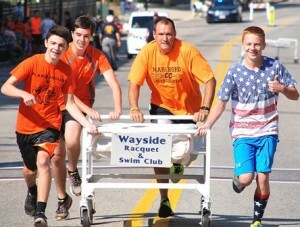 Racing toward first-place victory in 1:53 is the team sponsored by Wayside Racquet & Swim Club, consisting of (l to r) Marlborough High School Cross Country runners Owen Crisafulli, Tom Redden, Coach Jeff Downin and runner Jeremy Barnes. 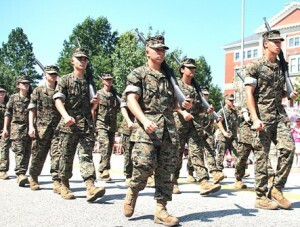 Marching in the Marlborough Labor Day Parade for the first time are U.S. Marine Corps JROTC cadets of Assabet Valley Regional Technical High School, led by Chief Warrant Officer 3 Randolph P. Mann. Darren McLaughlin and his wife, Laura, ride in a convertible as he’s honored as the grand marshal.